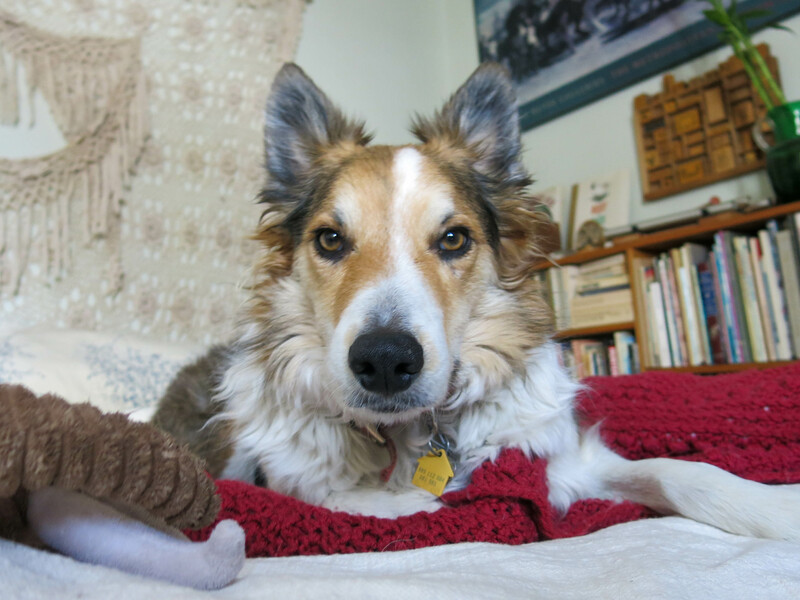 Greetings and salutations, everyone; yes, once again it is I, your popular host, Mani the purebred border collie, here today to be a bit philosophical, as can be the tendency here. You may remember me from such posts as “At A Standstill”, among so many, many others. Events of the last few days prompted a lecture on disappointment. I kind of paid attention. There have been a couple of times when I wasn’t able to go to Day Care, because they were closed for the holidays. One time I had a cough. So I sort of got it. And there are times when something happens on my walk, like a hugely loud noise, and I have to turn around and go home. I look forward to my walks every day and having to go home in the middle of one is very disappointing. According to You Know Who, there has been way too much snow on the ground for way too long. It’s okay by me, but the guy I live with says this is “excessive”. I admit it has been pretty gloomy here, especially when the sun goes down. It was pretty warm outside, though, and that seemed promising. Yesterday, for instance, was a pretty nice day. I lay out on the patio for a while. The guy I live with did something; I forget what. He was feeling pretty good because the snow was beginning to melt; pools of water were forming by the back fence, which is the lowest part of the yard. If you look back through my previous January posts you’ll see that most of them don’t feature a huge amount of snow in the garden. And if it does snow, it usually mostly goes away in a few days. 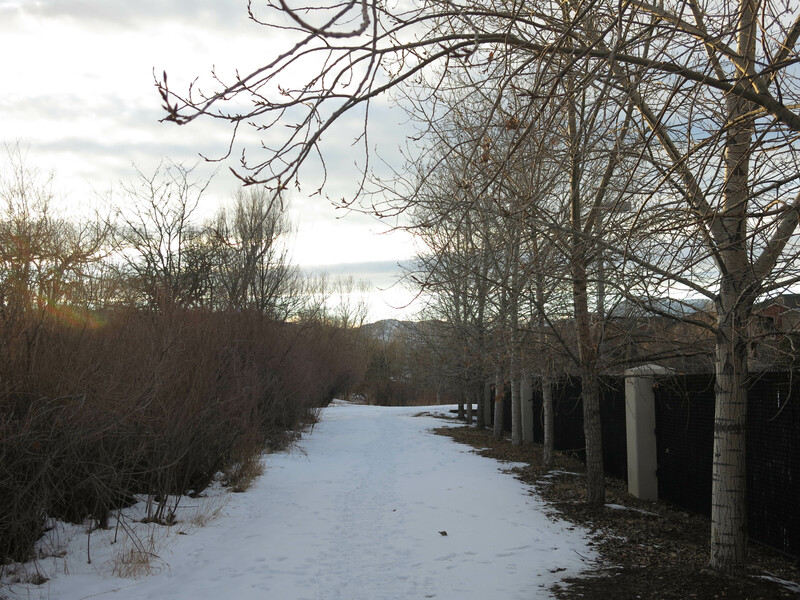 The guy I live with has always thought January was an especially pleasant month in Denver. So things were looking sort of up. There were flowers in the bulb frames. 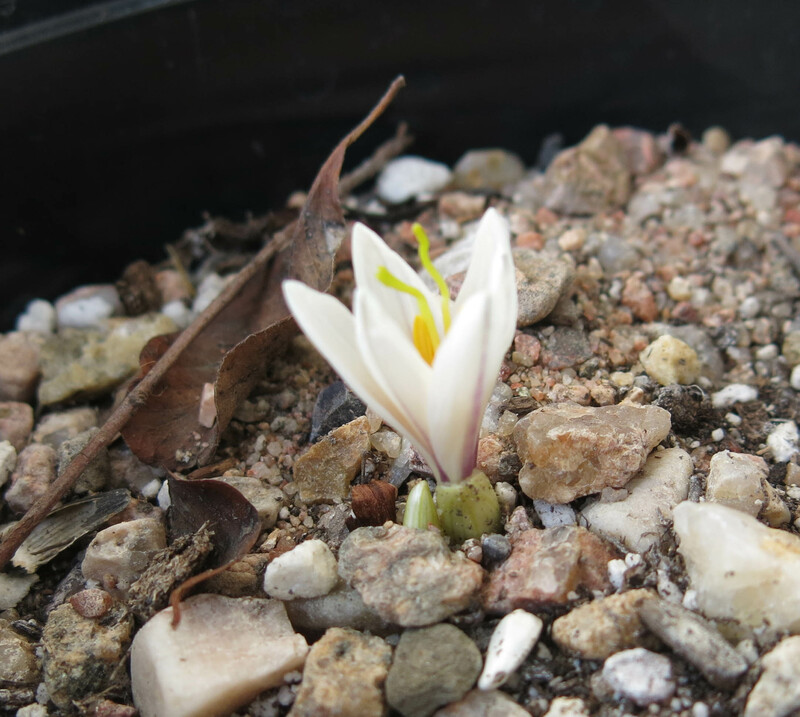 Little Colchicum kesselringii, for instance. I know this could have been a better picture, but I didn’t take it. 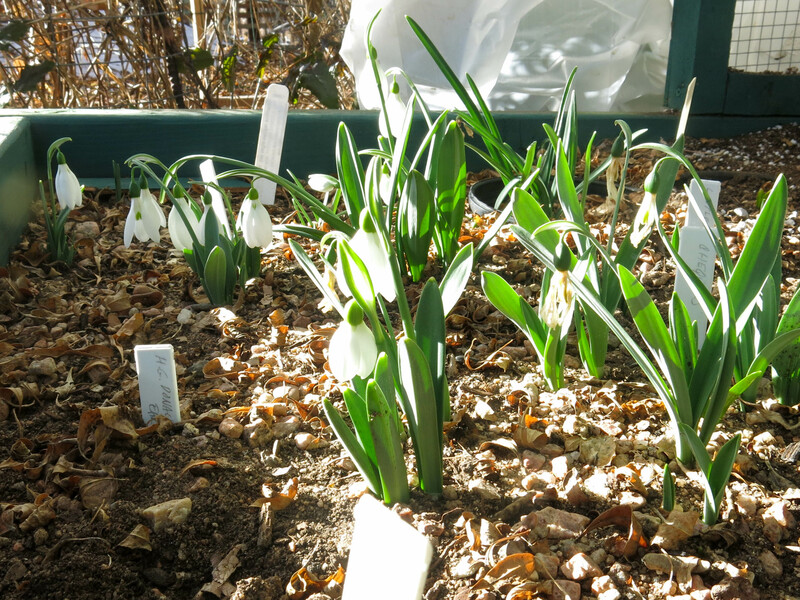 And of course snowdrops, in the Snowdrop Frame. Another pretty awful picture, if you ask me. The wind came up last night, like it hasn’t in a long, long time. When we woke up there was a bunch of snow everywhere. I heard a loud sigh, a sigh of disappointment, that lasted for about half a minute. He did begin to wonder, partly out loud, why he had become so interested in snowdrops about twenty years ago, when the winter weather seemed to be getting worse (defined as snow lying on the ground for more than a couple of days), but he couldn’t think of anything else that was more interesting. He does like to stare at the floor a lot, though. Back in “the old days”, he said, he could count on flowers in the garden in every month of the year. 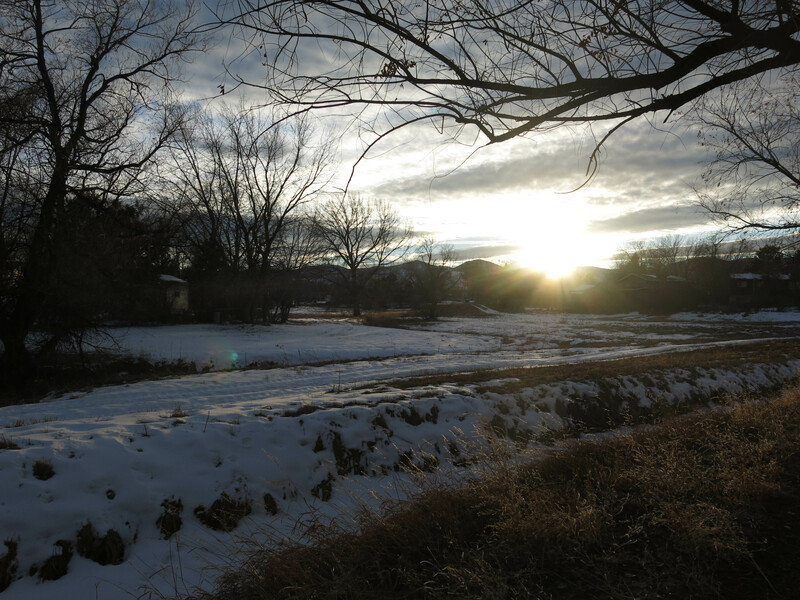 Denver didn’t have winters like they have farther north with snow all the time. This was before he learned that disappointment was a basic fact of life. He’s been looking for a book for several days now; one that he held in his hand and put back, but he can’t remember where. This is a bit disturbing for someone who has a perfect memory like he does, but these days he is often distracted. He went down into the studio to see if the book was there, but it wasn’t. 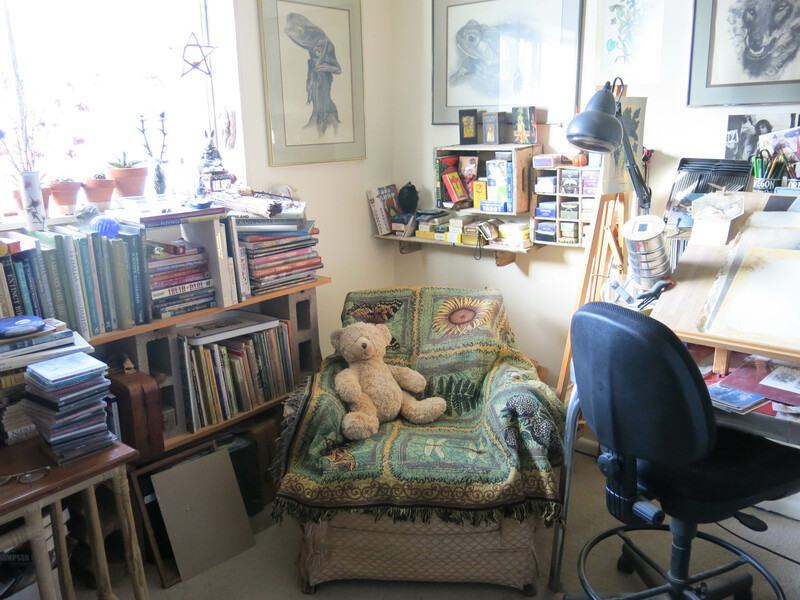 Ambrose the teddy bear was sitting in his chair, like he has for years. It seems to me like he’s waiting for someone. It might be a little heavy-pawed to talk about disappointment here, but it’s fairly obvious to me, even though I showed up here a little less than four years ago. And now there’s this other thing. His doctor said he had to exercise more, because of the treatments, so today he shoveled our driveway and sidewalk, then the neighbors’, then another neighbors’, then another neighbors’, and then yet another neighbors’. He said that was his exercise for the day. I still got to go on my walks, of course. I got ice in my paws, but it was okay. So now, with all this talk about disappointment and stuff, I’m not sure what’s going on here. I know the guy I live with will have to go to radiation therapy in a few weeks; he’ll be gone for about an hour every day, which is certainly a change in our daily routine. He said he found something to wear, when he went. It used to be his wife’s. It fits him better than it did her. I didn’t really get it. It may be possible that I don’t understand him at all. Maybe I should start paying more attention. I’ll have to sleep on it, first, though. Oh, oh, adorable dog! You look so lovable while asleep! On the other hand, when you write of disappointment, a certain *edge* enters your voice. You and guy you live with are going to have to pay attention and be kind to each other, snow or no snow, sighs or no sighs. I am sorry your paws iced up. About all that snow-shoveling going on: tell the guy not to kill himself before he saves himself. I predict that tee shirt is going to be a great hit in a certain treatment room, maybe even bring “Favorite Client” status. Sweet dream, Mani. Thanks. I’ve discovered that I can lean my head against one of the rails, or whatever, of the rattan couch. It’s very comfortable. I love the couch. The guy I live with said his doctor told him his heart was in good shape, though he did know when to take a break. Thanks. I try to look fabulous. It’s not much of an effort, really. January and February used to be nice here, with maybe some very cold weather now and then. Now they’re not nice. Times change, I guess. 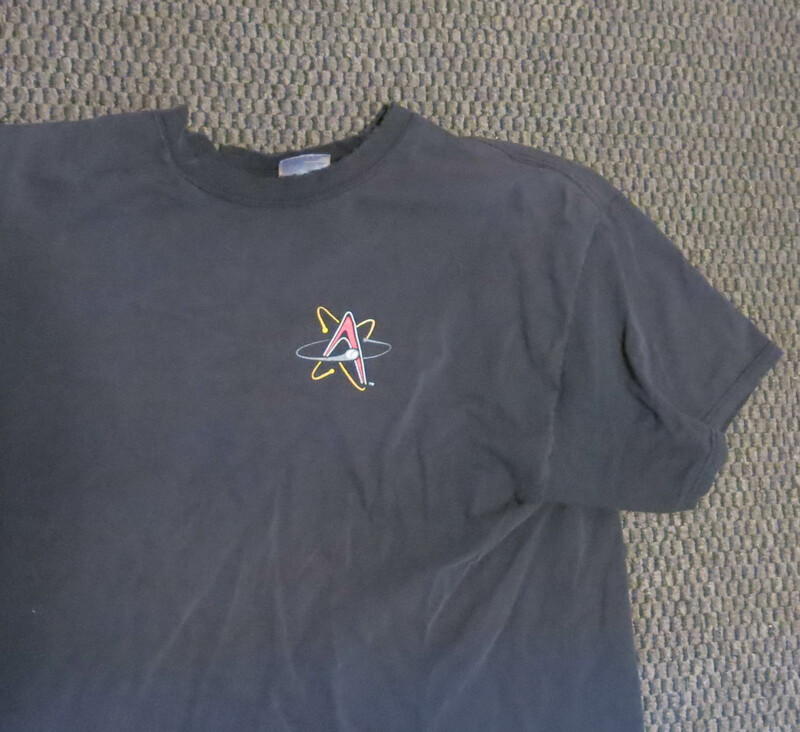 Ah, the Isotopes! We went to a couple home games during a tour of NM some years ago. One of the games went into extra innings – FIVE extra innings and ended at mid-night. The sideways neck napping position is clever as it allows you to remain eternally vigilant and yet relaxed. Good luck with the radiation; as I recall staying hydrated is especially important during those days. The guy I live with got a water bottle from the urology center, so he can drink water before he shows up. Kind of a guy thing, you understand. I am always vigilant, even when asleep. What a fabulous T-shirt for the occasion. Best wishes to you both. Thanks. The t-shirt is a bit worn. That never stopped him. You are breaking my heart a little bit the way you sleep with your head up on the sofa arm, which was the characteristic pose of our beloved Kozzie, three years gone. Oh, yes, that sort of thing can be hard. I just started doing this a couple of months ago, and it’s nice. An early ‘Topes shirt! Collector’s item. It’s cool that TGYLW will be wearing it as they are the Colorado Rockies AAA team Isotopes games can be fun to attend. Who can resist a little kid loudly singing along to a song called “It’s Raining Tacos”? But we co-opted that in 1990. I voted for the name, for sure. The Dukes? Nohh, Has-beens. Yeah. The guy I live with says he always thinks of Monty Burns’ line, “There’s a *New* Mexico” Repeated by Homer in a later episode. The guy I live with hasn’t been able to watch The Simpsons since his wife died. Not as fun watching it alone, I guess. I like the “roadshow”, though. 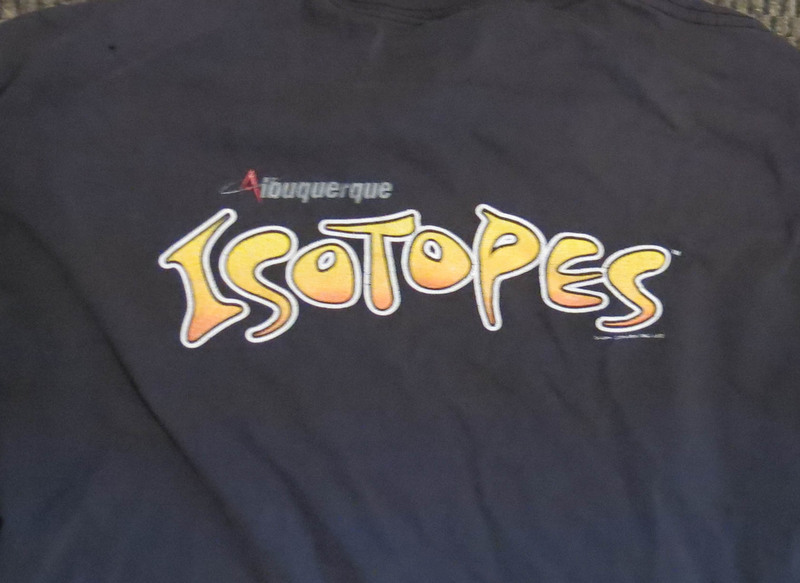 I thought that the Isotopes were from the Simpsons. Either way, this is something we should not joke about. It’s okay. The guy I live with thought wearing that t-shirt to radiation sessions would be pretty funny. He was kind of overwhelmed by all the things in the last several weeks, though, so some comic relief seemed necessary. Perhaps you should engage in mischief to distract him a bit more. Have you ever tinkled on his boots? No. 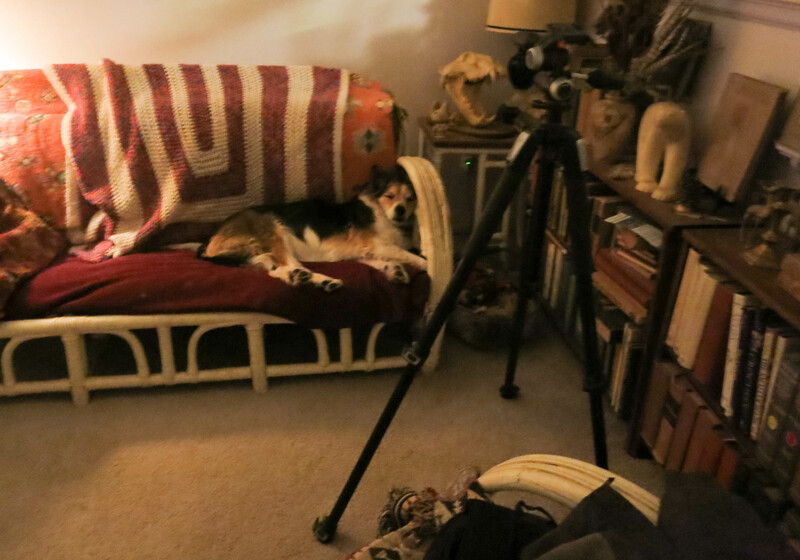 But the guy I live with said that Pooka, a purebred border collie who lived here in the last century, once accidentally tinkled on the guy I live with’s wife while she was weeding. He was very sorry. Meow meow Mani yore a furry filly-soff-ical poochie…mee leernss sumthing mew(new) efurry time mee reedss one of yore postss. THE flower photoess are purrty guud mee thinksss…..an if yore PawPaw thinks you have a lot of snow hee shuud stop bye our blog an see our photoess!!! An mee will tell you wee are havin a blizzard tonite an there iss over 4 FEET of snow! An wee can not see across THE street at all. Oh an iss -20 fairenhite too……Iss like all THE Winter came inn one month! 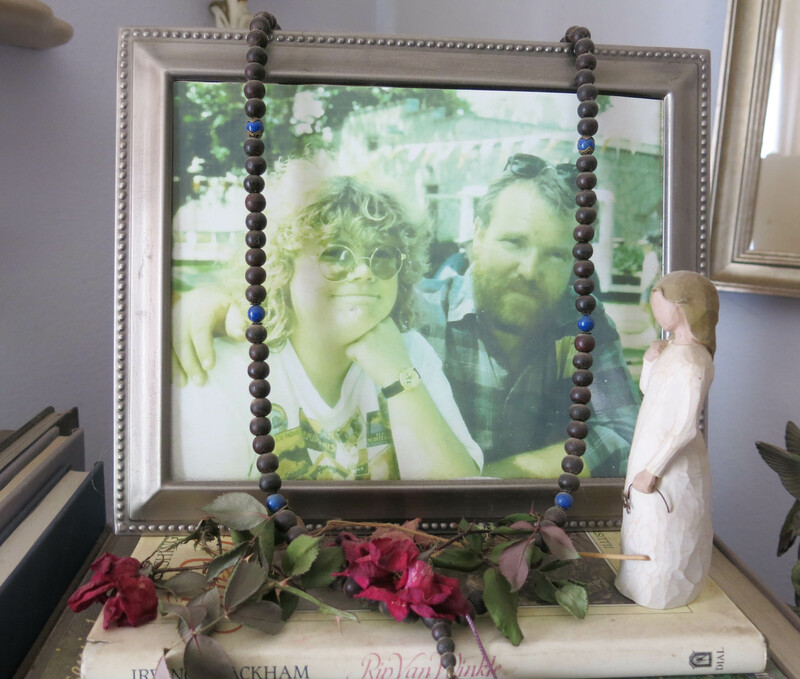 An may mee say mee LadyMew got teery eyed over yore PawPaw’ss photoe of himself an his ladywife….shee too knowss THAT feelin havin losted 2 husbandss…. Mee hopess his ra-dee-a-tion goess well an hee feelss ok an bettur soon. Thanks. The radiation starts in three weeks. That’s kind of a lot of snow. I hear there was that much here in the Blizzard of ‘03. Wet, heavy spring snow. Destroyed a lot of trees. LadyMew reemeemburrss yore Blizzard of ’03!!! It was BIG mews upss here then!An wee have sum heavy snow an then lite an then more heavy! Thanks. The guy I live with would prefer no snow at all. Mee with yore guy Mani! LadyMew thinkss more snow iss bettur??? Shee iss weered rite? Yes, we would say she is weird. The guy I live with sometimes says, with the way people talk about snow here, they’d like it nine months of the year, with rain the other three months. A Sunday morning Bagel/Donut ambush. Thanks, though the guy I live with says he gets enough exercise walking me. I like to walk fast, especially on the sidewalk. He also bought an exercise bike, but, lately, has had some issues riding the bike, because, well, um, it’s not as comfortable as it was before the Big Procedure. But he tried it the other day and it was okay.